Looking for a great way to relax after a long, busy day? How about a chair which is like a plush sofa chair on steroids? Try easing into comfort with a glider chair. Glider chairs, such as the Bow Arm glider with an ottoman (shown), take relaxation to a whole new level. And that’s because it gives you the great feeling of sinking into the plush, comfortable sofa chair. Also, you’re able to rest your feet on the equally soft ottoman. Plus, you can glide back and forth. As such, a glider chair with an ottoman is so comfy, it’s perfect for rocking a baby to sleep. Bow Arm Slat Glider with Ottoman features a timeless Mission style. Brandenberry Amish Furniture, Shipshewana, Indiana, offers a wide selection of Amish-made glider chairs. And these include the Bow Arm glider shown. This glider features wood slats, elegantly bowed arms and decorative wood corbels. Also, the builders gave it a smooth-gliding mechanism. Skilled Amish artisans custom-craft each glider chair. And they use solid regional hardwoods. Plus traditional construction skills handed down from their ancestors. So, with proper care, families can enjoy this glider chair for generations to come. Brandenberrry Amish Furniture offers a large collection of glider chairs. 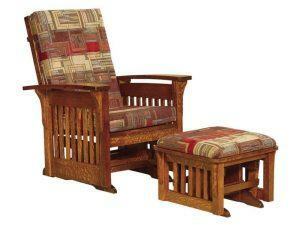 The collection includes traditional wooden glider rockers, swivel gliders, and loveseat gliders. Buyers can order a glider chair as shown. Or, they can work with the expert consultants at Brandenberry to create a glider rocker to their specifications. Options include a choice of fabric and leather, wood species and stain/paint/dye choices. More information is available at Brandenberry’s website.